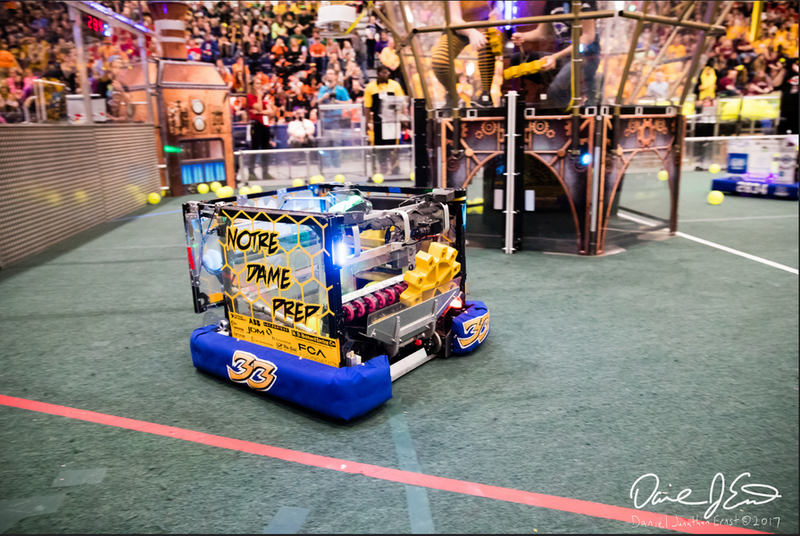 On Saturday, November 11, 2017 the Killer Bees of Notre Dame Preparatory finished the FIRST Robotics Competition offseason by co-hosting the 5th annual All Girls Tournament in partnership with teams from Bloomfield Hills High School, International Academy – Central and Brandon Schools. After six rounds of qualifying matches, the Killer Bees partnered with FRC Teams 2337 (Grand Blanc), 240 (Monroe) and 4961 (Almont) to win the tournament. 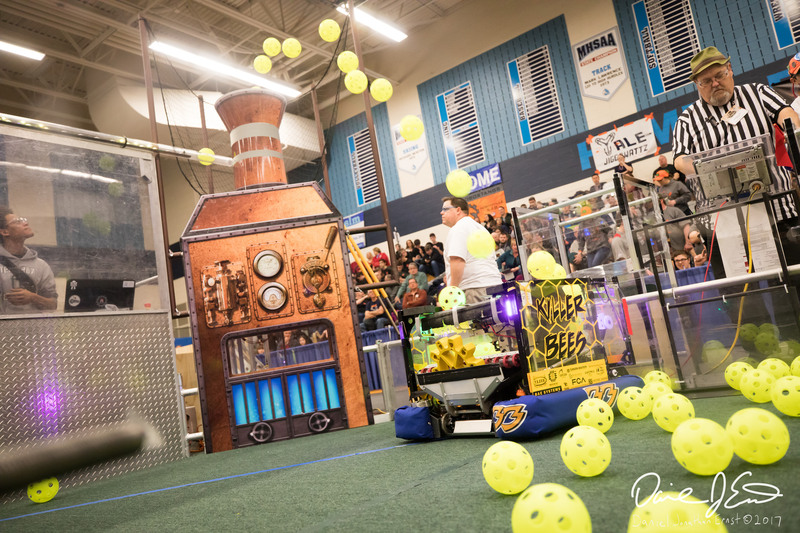 The tournament provides women on FIRST Robotics Competition teams the opportunity to drive and operate robots built by students and professional engineers. The “pit crews” must be all female as well. Other team members provided advice, assistance, scouting data and input on strategy. This event provides all students on the team with new perspectives and opportunities to perform in new roles. The FIRST Alumni and Mentors Network from the University of Michigan provided many volunteers for the event. The college students took a break from their homework, sharing their expertise and knowledge with the high school students. Amanda Kline was named as Volunteer of the Year for her work as a technical resource for the participating high school teams. 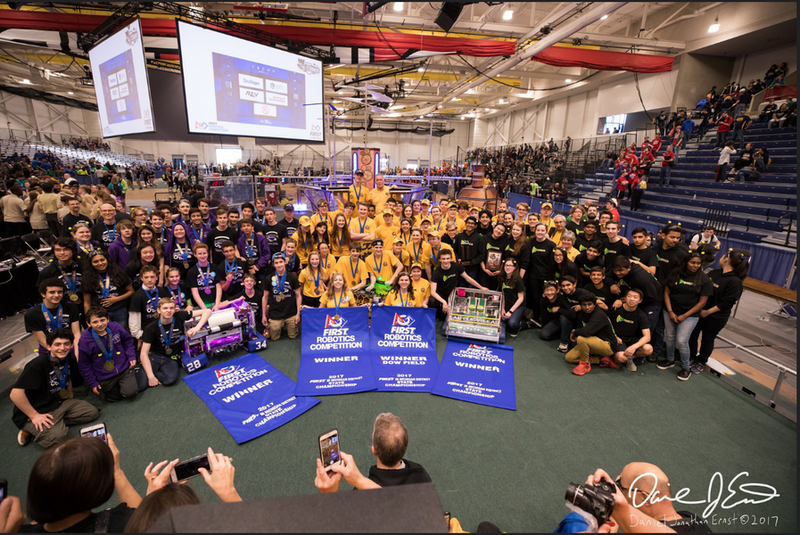 Five $1000 scholarships were awarded to senior women from FRC teams 772 Sabre Bytes (Lasalle, Ontario), 2834 Bionic Black Hawks (Bloomfield Hills), 68 Truck Town Thunder (Brandon), 1189 the Gear Heads (Grosse Pointe), 3322 the Eagle Imperium (Ann Arbor). Faurecia of Auburn Hills and Thyssen Krupp provided generous support to the scholarship fund. The team competed this weekend at MARC in Monroe. As is the tradition, it was a very warm and steamy gym in late June, but we kept cool with free ice cream and air conditioned pit areas. At the end of the qualification matches, we were ranked #2 and were selected by Goodrich RoboticsTeam 494 Martians as the #1 Alliance and added Robostangs 548. We battled hard in 3 matches in quarterfinals and 3 exciting final matches, earning the finalist trophy and a judged award for our autonomous routines. Congratulations to Team 51 (Pontiac Wings of Fire) and The EngiNERDs – Team 2337 and FIRST Team 1732 – Hilltopper Robotics from Milwaukee, Wisconsin as the 2017 MARC Champions. As a side note – one of our Killer Bee rules is “Never Give Up”. Team 2337 was in last place at the end of the qualification matches on Friday night and ended up as the 16th ranked team and ultimately as the MARC winner. Our next competition is the Indiana Robotics Invitational in July! The summer of 2017 will feature some very busy Killer Bees! Buzz 22 has been to elementary/middle school visits and NDP’s Freshman Launch to recruit new students for the 2017-18 year. We are excited as Notre Dame Prep is constructing a new wing to include new classrooms and a robotics lab. This will allow even more students to bee Killer Bees! Our application process will formally begin in mid-August. The team will bee at several off-season competitions, playing the 2017 FIRST game, “Steamworks”. We are playing several tournaments including the MARC (Monroe Area Robotics Competition) on June 23-24, the (IRI) Indianapolis Robotics Invitational on July 13-15, Kettering Kickoff on September 16 and we are co-hosting the Bloomfield All Girls Tournament on November 11, 2017. We had a great FIRST season and are looking forward to more fuel shooting, gear hanging and robot climbs over the summer. In addition to our off-season competitions, our outreach program will return to some of our favorite places – the Baldwin Center in Pontiac and the Maker Faire at the Henry Ford museum. We are adding a new project to build collaboration with other Catholic high school teams, working at the Forgotten Harvest farm in Fenton. Over the summer, the Killer Bees will sharpen and learn new skills by building VEX robots to play the VEX EDR game, “In the Zone”. We will have many teams showcasing creative solutions to the engineering challenge and are looking forward to the 7th annual Killer Bees VEX Tournament in December. And – last but not least, the students and mentors are fueled up and working to iterate and update the most interesting subsystem of the the 2017 robot. Stay tuned for details! We have an official team motto, “Teamwork keeps the hive alive” and an unofficial motto, “The Hive Never Sleeps”. The summer of 2017 will be a great example of both. This past weekend was the FIRST in Michigan State Competition. It was held at Saginaw Valley State University’s unBEElievable facility where the top 160 teams from the state competed for the Michigan State Championship. In the first year with assigned divisions at MSC, the Killer Bees were assigned to the Dow division along with 39 other amazing teams. On the first day, our team consistently was spectacular by shooting fuel, delivering gears to the airship, and hanging at the end of every match. After the first day, our team was ranked 3rd and had a record of 3-1. On the second day, our team continued our success, going into alliance selection as #1 seed with a record of 10-2. 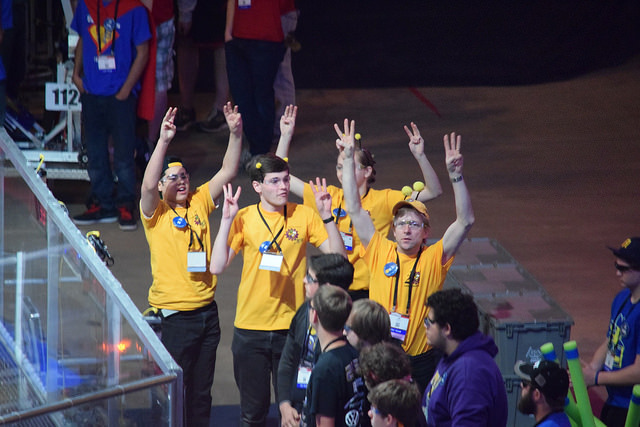 As first seed, our team was the alliance captain of the #1 alliance in the Dow division. Thanks to our scouting data, we picked Team 2834, the Bionic Black Hawks, and Team 469, Las Guerrillas. After a set of tough matches, our 3-2-1 alliance won the Dow division playoffs with a 10-0 record! By winning our division, we headed into playoffs with the other three division winners (Consumers Energy, DTE Energy Foundation, and Ford). Our alliance beat the fantastic DTE alliance in the Semifinals and the outstanding Ford alliance in the Finals without going to a single rubber match. All our hard work paid off with the State Championship win alongside our partners 2834 and 469! Not only that, but our alliance never missed a hang and almost got the fourth rotor in every single match. 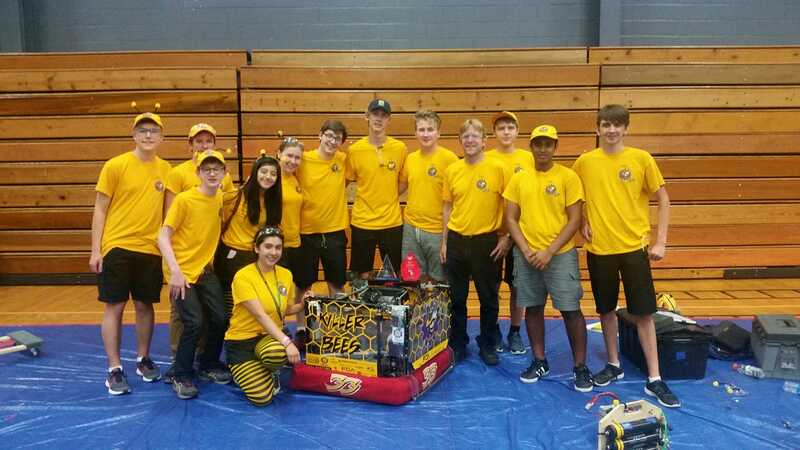 The Killer Bees BUZZED with excitement after finishing the weekend as #1 in the FIRST in Michigan standings, and our team will continue to further our success at the St. Louis FIRST World Championships next week. You can watch our MSC Video here. 2016 was a pretty successful year for the Killer Bees. This year was the 21st year of our team being around. We attended two district competitions, The Michigan State Championship, and The St. Louis Championship. We had a good performance overall at all of these events. Our first competition was at The FIM Waterford District where we had an average OPR of 34.55 and seeded second overall. Our robot didn’t connect to the field for the first 3 matches, but we overcame that problem! We gratefully accepted an invitation to join the first alliance with Team 67, The HOT Team and Team 4003, Trisonics. We played against the 8th alliance consisting of Team 3773, Team 5662, and Team 3302. We won in quarterfinals by a 54 lead in the first match, and 101 point lead in the second match. In semifinal matches we played against the 4th alliance consisting of Team 201, Team 3667, and Team 4779. We won by 70 points in our first match and 66 points in the second match. 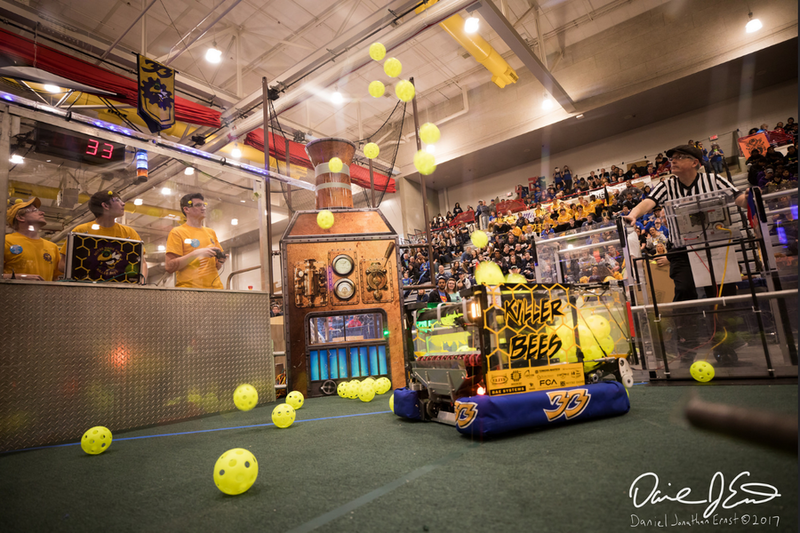 In the final matches we played against the 3rd alliance, consisting of Team 5860, Team 355, and Team 5048. We won by 67 points in the first match and by 83 points n the second match! In addition to being the District Event winner, we also won the District Chairman’s Award! Overall this event was very successful! Our second competition was at the FIM Troy District where we had an average OPR of 55.05 and seeded first overall. 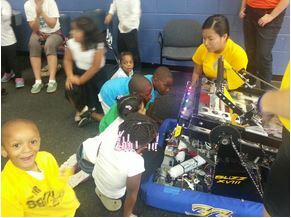 We requested the assistance of Team 1718, The Fighting Pi, and Team 5068, The Outsiders. We played against the 8th alliance consisting of Team 4961, Team 6120, and Team 862. In quarterfinals we won by 32 points in the first match and 53 points in the second. In semifinals we played against the 5th alliance consisting of Team 2851, Team 573, and Team 6108. We won the first match by 32 points and the second by 24. In the finals, we played against the second alliance consisting of Team 2337, Team 3539, and Team 6013. We won the first match by 9 points and the second match by 22! In addition to being the District Event winner we also won the Quality Award! Our third competition of the year was the FIM State Championship. At MSC we met Rick Snyder and Don Bossi! We had an average OPR of 61.47. We gratefully accepted an invitation to join the 1st alliance with Team 2767, Stryke Force, and Team 1684, The Chimeras. We won our first octofinal match by 67 points. Sadly we lost the last two matches by 7 and 2 points! After we were eliminated we managed to get all the changes we wanted to do at St.Louis Championship done before pits closed! We were able to qualify for the World Championship! Congratulations to our friends 27 Team Rush, 67 The HOT Team, 1718 The Fighting Pi, and 6086 Igniton! Our fourth competition of the year was The St. Louis Championship! We were placed in the Tesla Division. We met up with the other IFI teams and learned about each others robots and took a great photo! Our average OPR was 62.08 and we were the first pick of the 3rd alliance. 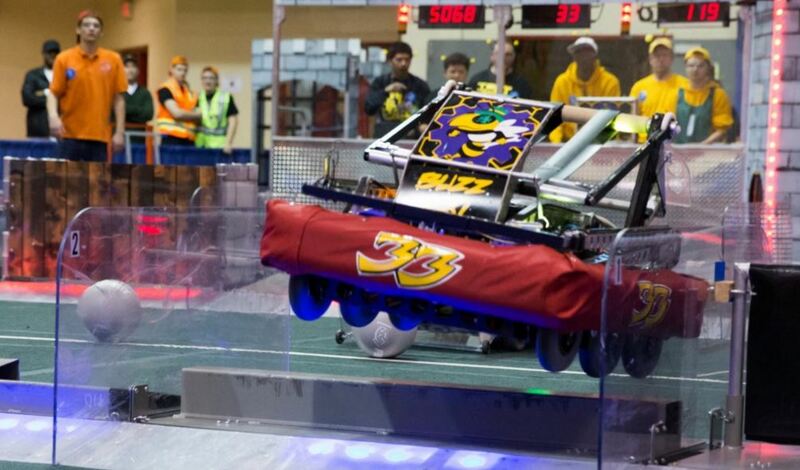 We teamed up with Team 2834, the Bionic Blackhawks, Team 1756, Argos, and Team 329, Mohawks. We played against the 6th alliance, consisting of Team 4391, Team 5117, Team 2337, and Team 5854. We won quarterfinals by 67 points in the first match and by 29 points in the second match. We played against the 2nd alliance, consisting of Team 2451, Team 1806, Team 1306, and Team 2194. We won semifinals by 98 points in the first match and by 57 points in the second match. We then played against the 1st alliance, consisting of Team 2056, Team 1690, Team 3015, and Team 1405. We lost quarterfinals by 65 points in the first match and by 40 points in the second match. Thanks to our alliance to help us be the Tesla Division Finalists! Also Congratulations to the 1st alliance representing Tesla on Einstein! Overall, Buzz XXI had a successful year! Thanks to all our mentors, sponsors and our parents who made everything possible!